Kai, not to be outdone by his sister, has his own explosive plans. and make some things go BOOM! it’s no phone you’ll hear ring. of that there’s now no doubt. Who wants to bet that the dragons have one epic roll of their D20 each? I’m betting that Kai’s next roll ends up a 1. Dragon be nimble, dragon be quick, dragon don’t give poison a lick… that last one was hard…. in a team of adventurers bold. while the force of good prevails! Is this a modified “Under the Misty Mountains” song from the Hobbit? Either way it I think it’s awesome. Nope, although it was similar to some rhymes that I was thinking of when I watched the movie. It sure beats the teeth out of the crappy poem I came up with at first. the party and the hoard. To elaborate to Robin: You are technically correct in that “anyone” falls under the same category as “everybody” being a singular 3rd person word and should use “has”. The word choice here, however, triggers one of those exceptions to the rules English is well known for. I’m too rusty to remember which specific exception is at play here but it has something to do with the sentence being a question. I agree with Panther on panel five. About the gunpowder: What era do you think it is? While not wide spread, gunpower and guns have existed in Europe since 14th century, i think. Let’s hope Kai get’s another good roll to evade the falling wagon. Explosions are not the best idea in enclosed spaces, they tend to hit everyone. 1. Put wagon on rails and board it. 2. Cast fireball on gunpowder. 3. Ride deeper into mine with explosion in the parties back. I don’t think Kai stayed still long enough to be hit by the falling mine cart. Looks like: approach-strike-leave all in one smooth motion, to me! Yay! I love panel 3; especially, the expression on the blue-haired zombie girl at the other zombie with Rex’s “fwomp” sound effect is funny. Gunpowder made it’s way to Europe during the mideval era ( sometime during the 13th century is as close as I could pin down) I’d say it makes sense here. Granted it wasn’t normally used for mining. I imagine we’re not going to see many hard numbers throughout this. Robin is probably making up the game rules on the fly and not giving any hard numbers for hit points and skill checks, etc. allows him to keep himself from accidentally writing himself into a corner. Wow; two 20 rolls in the same session – does that happen often? I once saw a guy roll 13 boxcars (12) with honest dice (2D6). Calculate the odds, I think they are a quintillion to one. 1 in 400 chance (20^2). Depending on play style, you can easily end up rolling hundreds of times in a play session (and thousands throughout a campaign). As the old saying goes, you can solve any problem with a keg of gunpowder. When in doubt, C4. — Jamie Hyneman. See no such thing as to much explosives no matter what form they take. Shadow step for Kai. Well chosen. Now let’s make sure he can reverse it in time to get back to that barrier. I don’t think those dragon scales get factored into his in-game damage resistance. Not unless Benji wanted Kai and Kaya to be super armored up right off the bat. Keep up the good work, Robin! I look forwards to seeing where THIS roll takes us. And remember, stay awesome! The funny part about this is that I know some players that would do something like this. It was, I haven’t played with anyone since a few sessions in college, and that was a few years ago. Chekhovs barrel of gunpowder. If it’s included in the scenery, it will go off at some point. But the blue haired vixen is digitigrade . Why such a difference ? There are different levels of hybrids, some have more animal in them than others. It’s pretty randomly decided. (in a design sense, I design until I have something that I’m happy with :p) The blue haired vixen is also a cameo character, and her design fitted very well into the universe so I kept it with digitigrade paws. See, this is when “needlessly reckless and overkill, probably might get us all killed” is indicated. It’s that situation where if you do something, you might get killed, but if you don’t, you WILL get killed. …and nuking a bunch of rats with a certainty of collateral damage. With regards the ‘other’ adventure, I’m actually feeling bad… for the Plushy. Aaaargh! but they might be able you help you keep up with the questions in your ask the dragon thing. im only guessing your doing this by yourself. I have thought about getting help, but I’m not comfortable giving the artistic process to other people for Twin Dragons, even for the asks. Guest art might be an option, but I can’t rely on that every time. That said, I’m thinking of a solution for the asks that might be more doable for me to commit to. 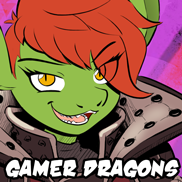 I also want to bring Gamer Dragons back, but I’ll have to see what’s possible. can i ask you to make a pic for somone els i just think i funny i copyed this line from his story. Fenek ended up flopping lazily on my head, making me look absolutely ridiculous, but he refused to move, so I was stuck with a dragon hat. that would make a awesome and funny pic! here is his profile on devent art. As all the thoughts I had about this page has been voiced by other readers, I am left to say that this is another great page, keep up the great work, and stay awesome! Let’s see if Kai’s plan works in our heros’ favor.